Below is County Map of Lake in California showing the boundaries, roads, highways, towns and much more. Incorporated on May 20, 1861, Lake County is located in Northern California. It is named after Clear Lake which is a dominant physical feature in the county and the largest natural lake entirely within California. 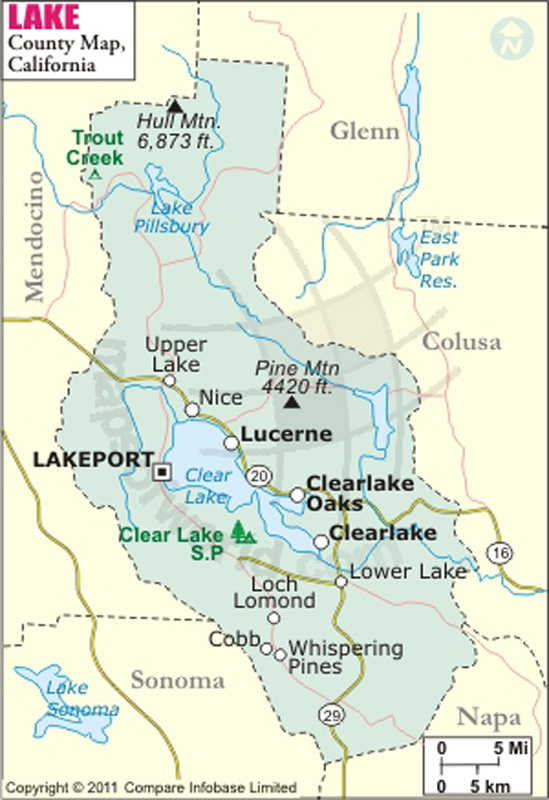 The county seat is Lakeport and the most populous city is Clearlake. The county comprises a total area of 1,329 square miles. It is a part of California's Wine Country with five American Viticultural Areas and at least 35 wineries. Lake County has also been consistently ranked as having the cleanest air in California and the United States. The unspoilt wilderness of Mendocino National Forest covers the northern portion of the county. With over 100 miles (160 km) of shoreline, Clear Lake attracts water enthusiasts to enjoy swimming, water skiing, sailing, and jet skiing. Fishing in Clear Lake is a good pastime of county residents. Cobb Mountain and Mount Konocti are the tallest mountains in the region. Both are popular destinations among hikers and nature lovers. Clear Lake State Park, Anderson Marsh State Historic Park, Lower Lake Historic Schoolhouse Museum, and Harbin Hot Springs are major points of interest in the county. Lake County is about three-hour drive from San Francisco and Sacramento. State Route 20, SR 29, and SR 53 are major corridors in the county.